View our latest editorial features on Houzz: <a rel="nofollow" target="_blank" href="https://www.houzz.com/ideabooks/97952025/list/the-10-most-popular-dining-spaces-of-2017">https://www.houzz.com/ideabooks/97952025/list/the-10-most-popular-dining-spaces-of-2017</a> <a rel="nofollow" target="_blank" href="https://www.houzz.com/ideabooks/85947086/list/what-its-like-to-live-in-a-frank-lloyd-wright-house">https://www.houzz.com/ideabooks/85947086/list/what-its-like-to-live-in-a-frank-lloyd-wright-house</a> As noted in many interior design publications "Laurel is a conceptual artist that takes the blank canvas of a space and transforms it to a living work of art." Attention to detail in all aspects of the design is primary to her work. Art history and extensive decorative arts background enriches her interiors by emphasizing an eclectic mix of periods of design. She is sensitive to the architecture and space of a project while always maintaining her client's needs and their personal desires. Laurel works to make the design process one of enjoyment for clients. Designing beautiful interiors that create, define and express the people who live there is the work that continues to inspire us. For over 30 years, we have been singularly focused on developing a design collective whose purpose is to exceed our client's dreams. Each project begins with a thorough evaluation of the client's lifestyle, to determine the required and the desired, likes and dislikes. A brainstorming session with our talented and energetic team follows, producing a vibrant kickoff that insures fresh and original ideas. Interior design is our passion and the results can be seen in our portfolio. 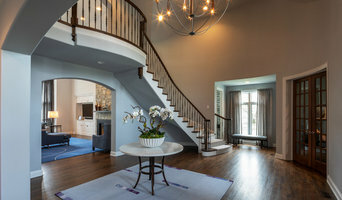 We take pride in creating unique and distinctive home designs for our clients to share with their friends and families. A passion for grace and beauty is apparent in all our interior design. Our work is characterized as "understated elegance", evidenced by comfortable furniture layouts, colorful, yet serene palettes, and respect for the architectural character of your home. Each interior is designed with the client's lifestyle, personality, and values in mind, creating a finished product that is a distinct expression of the owner. Chicagoland Interior Designer | Best of Houzz! Lisa Wolfe Design, Ltd is synonymous with creating sophisticated classic interiors with a bohemian spirit and a colorful spin. Known for her ability to comfortably push her client's out of their comfort zone while elevating their vision to a whole new level, her passion for interior design is ultimately reflected in the breathtaking spaces she creates for her clients. Her collaborative spirit and openness to her clients' ideas have produced amazing results and she is proud to to have her clients as some of her biggest cheerleaders and continued source of referrals. Lisa Wolfe-DiGanci is a full service design talent, offering interior design, architectural, construction and custom-build services for the residential market. She has partnered with Design Studio 24, LLC and Abington Builders to be a one-stop shop where collaboration, insight, experience, and a spectacular set of knowledge and eyes will carry you through the process from beginning to end. Not everyone needs a full renovation. Lisa also works with clients on room-by-room as well as a consulting-only basis. Contact Lisa Wolfe Design for your next project! We are a full-service design firm dedicated to creating your ideal living space. From one-on-one consultations in our Design Center and Showroom, where we help crystallize your vision and plan for your project, to partnering with builders and contractors and bringing it all to life. Our goal is to make your next design project an enriching, successful experience. We love being involved from the ground up in planning a new home. Working closely with your builders and architects, we can design a living space that is a cohesive, beautiful reflection of your personality and taste. You probably know me from my work on HGTV. I won the title of “HGTV Star” for Season 8 and currently, I am the designer and host of the “HGTV Smart Home Giveaway.” It may look glamorous now, but it’s been a long road to get here. I started out in high-end residential property management, with over ten years in the industry. After designing an award-winning model home, I decided to focus solely on interior design and launched Tiffany Brooks Interiors. Since then, my firm has done residential projects and boutiques in cities across the country, and I haven't looked back since. Randy designs environments that have a perfect blend creating a beautiful, unexpected, and interesting home. While paying close attention to her clients lifestyles and preferences, she integrates the perfect mix of her trained talent and her clients taste. She leads her clients on a journey to teach them that interior design is not only about their look, but is also about the quality and craftsmanship that goes into creating everlasting design. 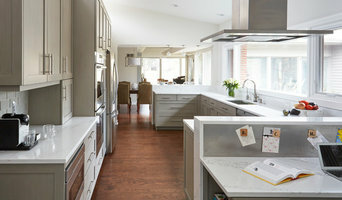 Chicagoland's Full Service, Client Focused Design Firm Best of Houzz! Ilene April has been successfully designing homes in the Chicago area for almost 18 years. She is a graduate of the Harrington Institute of Interior Design and an Allied member of the American Society of Interior Designers (ASID). She follows a philosophy of "good design", respecting existing architecture and appropriateness of space. Since 1994, Ilene April has been successfully designing homes throughout Chicago and the North Shore. She is an allied member of ASID and a graduate of the Harrington Institute of Interior Design. Ilene April follows a philosophy of “good design”, whether it be a greystone in Lincoln Park, a traditional home in Highland Park or a modern highrise on Lake Shore Drive. She lets both the architecture and the client’s personality shine through in her projects. Rather than starting with a blank canvas, a client’s personal treasure might be the jumping off point. She often works around family heirlooms and keepsakes from travels. She then takes her experience as well as an eye for mixing both traditional and contemporary and turns the space into something both personal and beautiful. Designing Houses, Creating Homes... JAFFE Architecture + Interiors is a boutique firm specializing in custom residential architecture, architectural interiors, and interior design. The firm’s style combines the spare lines of Modernism with the grace, proportion, and scale typically associated with classical architecture, creating a distinctive, blended aesthetic. JAFFE Architecture + Interiors has completed projects across the United States and in Europe. With JAFFE Architecture + Interiors, design is deliberate and informed. Homeowners are encouraged to provide input in the creative process, from defining the project’s overall plan to selecting interior details that fit their lifestyles. But JAG does the heavy lifting of creating the design, drawing the plans, generating construction documents, managing the bidding process, and overseeing the construction. We don’t stop there. We often complete the interiors with existing or custom designed furniture, lighting, painting, art placement, window treatments, and more. Our service is comprehensive to help you achieve a well-designed home. We eliminate the burden of pulling all this together and reduce the risk of something going wrong for a large investment. You get a beautiful, cohesive home through a process in which we take care of you beginning to end. Chicago Area Interior Designer 2X Best of Houzz Winner! Carly Callahan graduated from the University of Michigan in 2010 with a Bachelor of Arts in Communications. Soon after, she moved to New York City to pursue interior design. Carly attended Parsons, The New School for Design where she received an Associates Degree in Interior Design. During this time, she also had the opportunity to work for and learn from renowned Manhattan-based architectural and interior design firms. Formed in 2013 by Carly Callahan, Callahan Interiors is a full service residential interior design business. Highly Published & Acclaimed Interior Design - Space Planning Firm. With over 35 years of experience Shelly Handman heads a team of uniquely talented Interior Designers & Architects. Well, it's not really about us, is it? It's about you. Discovering your needs, defining your wants, and designing interiors to complement your lifestyle. Our goal? Rooms filled with beauty, grace, and personality (yours, of course - not ours). At Handman Associates, we believe that while an interior designer's good eye is critical to achieving that goal, an open ear will take a room even further. And so we ask questions. A lot of questions. All intended to understand the nuances of how you live - or how you want to live. That's why every project begins with listening to both the things that are said, and just as often, for the things that go unsaid. We believe this critical first step is the foundation of all successful interior design. Under the direction of Managing Principal Shelly Handman, each member of our staff can claim that finely-tuned, open ear, along with an unparalleled wealth of knowledge, experience, and always-reliable professionalism. At Handman Associates, we also believe good design is a theme with countless variations. Style is subjective; taste is personal. Still, good design will always incorporate comfort, warmth, timeless appeal, and an equal balance of both form and function. This belief is the hallmark of every Handman-designed interior. The truest testament to the success of our work is our clients themselves many with whom we have enjoyed years-long, and even decades-long, relationships. To us, those relationships evince the true power of good design. We create beautiful, comfortable and functional interiors that reflect the people living in them. Alisa Levy Klein is an interior designer with a love of design and the ability to bring out the potential in any interior space, and with over 20 years of business experience she understands how to work with budgets, manage projects, and get it done. She loves to work with clients, helping them figure out what their needs are, then designing a space that fulfills their needs in a beautiful, unique way.